I would like to see only part of a string that contains a text. sharepoint foundation – How to fill a text field with the name of the current InfoPath form view? We have a SharePoint list with an associated InfoPath form. The form has multiple views based on different field values ​​and rules, for example, view_item (all fields), new_item, edit_a, edit_b, and edit_c. How can I store the name of the view in a hidden text field in the form? We are using SharePoint 2013 and InfoPath 2013. How can I change the font size of the summarized text of the collapsed sticky notes (sticky notes)? I know how to change the font size of a sticky note, and how to save this as the default size for new notes. But it seems that none of this affects the size of the text when a note is contracted. It seems that all collapsed sticky notes use the same font size, no matter what font size is used when a note is expanded. I can not find a way to change the size of this font. I want to be able to collapse all my sticky notes and then be able to read them by setting their font size in something bigger. I am running a high resolution desktop. and the text is so small that it can hardly be read. Can anyone tell me how to change the size of the text that Stickies uses to display the summary text of a collapsed note? I was following this to throw additional Fields so they appear on the form using the calculated field and work perfectly. However, when I try to change the calculated field to the text box, it will not load into the SharePoint list when I click New or click on the item. It worked in the preview though. For example, in my case, my A list has a People and Group field and a Department field (text box), and my B list is "Personnel List" with the name of personnel, departments, titles, etc. Therefore, when you select People & Group, you must match DisplayName in People & Group with the name in list B with the department. Does offline voice to text now appear? I'm seeing a lot of articles that point to how to set the voice-to-text function of Android offline, but I'm not going into the settings where they tell me to search (languages ​​and input). Has the location changed, has it been removed? Does my phone simply do not have the capacity? I am creating an application in which the user can make multiple replacements with each other (for example, replace all "is" with "was", all "will" to "would"). The problem that I face with respect to the UX is how to indicate the changes that will occur in the original text. I was thinking of highlighting the pending changes in the original text, as if I were highlighting the text. Each replacement would have its own color. What worries me is that the user could replace all "a" with "an" and then "anmato" with "pineapple", then "tomato" would become first "anmato" and then "pineapple" (bad example, he). Changes could overlap and, therefore, highlighting would become problematic. I am able to discover an algorithm that highlights them with the color of the first replacement and the color of the second replacement, mixing the colors where they overlap. I'm not sure if this is the best way to implement this, so I thought about asking them if they know in a better way. Is it possible to change the text of the switch? That's. I searched on Google I did not find anything. it is necessary to extract two numbers from a text file and add them to two variables (X and Y). I'm trying to use CSV but I'm not getting it. 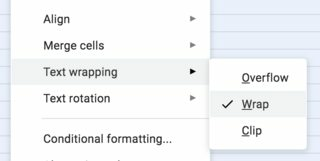 Suddenly, it seems that I am having problems with my Google Sheets to automatically extend the height of the cell with text adjustment, for certain cells. Finally, I thought that maybe text wrap applies to cells that are correctly formatted as Plain text, so I selected all the cells again and configured the format. Unlucky. Can there be an error with specific cells? Or copying and pasting text from other sources, such as Mac Notes, causes errors of this nature? How can I restore to default in such a way that text wrap Does it work for all cells?